What two word noun does this photo represent? EMAIL your answers and leave a comment designed to either help or confuse your fellow game players. The first contestant to EMAIL me the right answer wins a featured link in my blog which will display until next Monday when we’ll play this little game again. Enjoy. I’m stumped. Totally, completely and utterly stumped… and I’m too tired to stay up and think any more. Hopefully everyone else will be stumped too and I can catch up with them in the morning. Raven –you are so going to kick yourself when you see how close you came! Ah…. I was just lost in the woods this week. Well done! Stacy — the photo is your clue! 😉 See, your thoughts are supposed to go something like this: What is that? It is a towel and some hair. Towel? Towel? What does one do with towels? They soak up water or they dry things. But what’s that got to do with hair? Towel hair? Water hair? Dry hair? Hair towel? Hair water? Hair dry? — HAIR DRYER! I’ve got it! The first thing that comes to mind is probably not the right answer, but I’ll send it and keep thinking. But Barbara, the first thing that came to mind was the right answer! Annie — your correct guess is in. Karen — that is generally the case with all guesses. Not even the ghost of an idea here. Kelley — see my comment to Stacy! Well, if it’s a hair color I’d rather lose. Doug — not a hair color, but I am liking the color aspects of this photo. 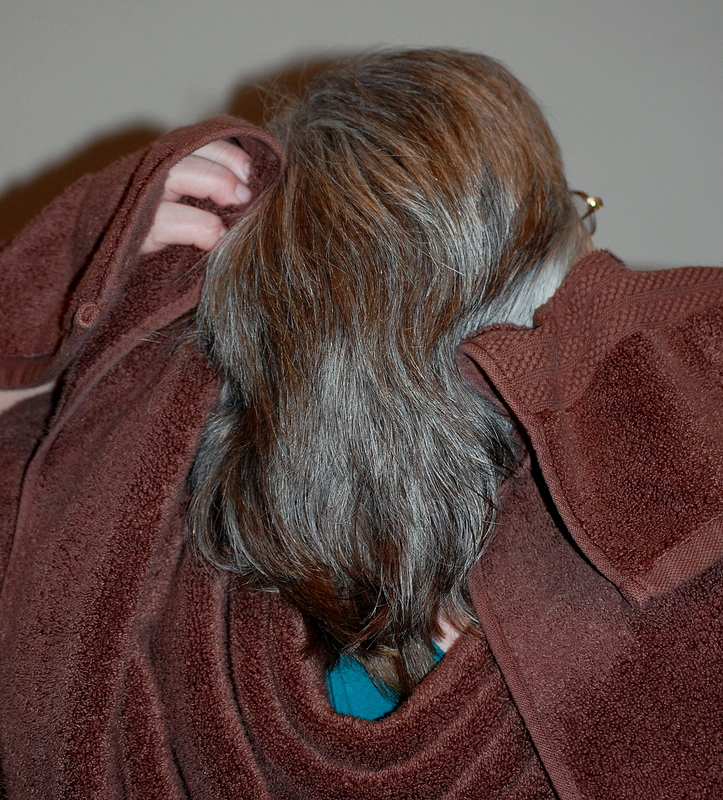 Thanks to the lighting, the towel and the fact that my hair is wet, I seem to have lost a substantial bit of gray! Heavens. I have no clue. Pretty hair though. Linda — I wish my hair really looked like that. See my comment to Doug! You know, I actually thought “hair dryer” then I thought, “no, that wouldn’t be it. It’s too obvious to be a pun” Sigh. I hope you’re feeling better this morning, Quilly. Jim — Thank you. I had a great sleep. I woke feeling great this morning but I am developing the headache and I am afraid I am not finished with the fever yet.